Going into a Fashion Entrepreneurship course, I had no idea about my capabilities. By the end of 1st Semester, I realized how International College of Fashion had already prepared me well as a designer as well as an entrepreneur. 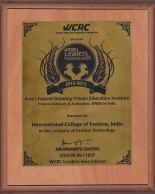 At International College of Fashion, I see my designing skills, creativity & professionalism increase day by day. It is a great learning experience at ICF with the experienced and well informed faculty members as our mentors. Studying in ICF gave me the opportunity to work on different projects which helpedmy designing skills flourish professionally. At ICF I can further explore my design andentrepreneurial skills. ICF has not only helped us with improving our creative skills but has also given usimmense opportunities to experience the industry hands on. Mr. Nikhil Mehra, Amateur designers have less knowledge about the intricacies of business outsourcing students at ICF learn.